Great news for the exhibitions industry as CEIR reports that trade shows are on a continued growth curve. Not only do the figures from the newest Center for Exhibit Industry Research (CEIR) report indicate robust growth for the trade show industry in 2015, but the outlook is already bright for 2016. The exhibitions industry has had 22 consecutive quarters of growth, dating back to 2009, according to the newest index published by CEIR. Charts published with the February 25th press release from the organization show the sturdiest expansion in the first quarter at 4.4% and a continuing strength throughout all of 2015, making the past year the most solid since 2011, when the industry began to bounce back from a sharp decline during the height of the recession from 2008-2010. Perhaps the two strongest indicators are the revenue growth at 6.5% and the attendance advancement by 4.9%. Trade Show News Network recently reported another CEIR executive looking towards the current year with a positive outlook: “The strong momentum in the exhibition industry could carry forward into 2016 and offset weaker macro factors,” commented CEIR’s Economist Allan Shaw, Ph.D., also the Chief Economist for Global Economics Consulting Associates. The addressable market is large. Exhibit sales and design are estimated to generate 43.6% of total industry revenue in 2016. This segment includes the sale of floor space at trade shows, conferences, conventions or expositions, according to IBISWorld. As an economic indicator, the upswing that trade shows have experienced in the past year is an encouraging one. 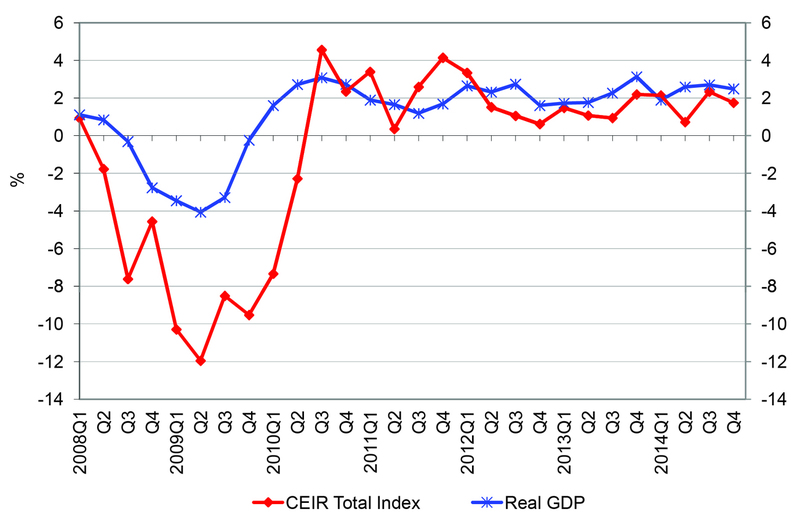 The release of the full CEIR 2015 Index on April 1 is expected to provide additional details. To help keep trade show attendees happy, companies like Veloxity offer device charging solutions. Exhibitors, event planners and venues often rent or purchase freestanding or portable device charging stations that power up events and attendees.